All British holidaymakers and expats affected by wildfires in southern Spain have been accounted for, according to sources. Around 300 British nationals were among thousands of people forced to flee their homes over the weekend as fire crews battled to contain blazes in the Costa Del Sol region. Two Britons needed hospital treatment for minor injuries suffered during the incidents, but a spokesperson for the Foreign Office said there were "no reports that any British nationals have died". 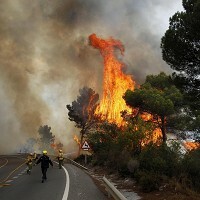 Spanish authorities brought the fires under control after the military was called in to dump water over the flames, which threatened tourist resorts such as Malaga and Marbella in Andalucia. The unpredictable inferno will have had many holidaymakers reaching for their travel insurance documents to protect themselves from potential loss or damage to goods. Expat John Taylor, who lives in Calahonda, said the windy conditions made the fire more widespread than ones that have affected the area in previous years, but hailed the response of the authorities.